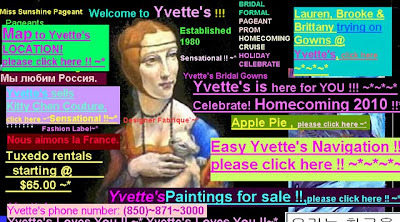 Who wants to see the ugliest website of all time? And it needs additional plugins to display all the media on this page. And it is, I think, about wedding gowns. This post is about the broken business models for the music and film industries, and another argument for fundamental reform in the entertainment business. Based on two articles in Techdirt - one dealing with the accounting for Movies (Harry Potter and the Order of the Phoenix, to be precise) and the other dealing with profit sharing in Music. Firstly the movies. All movies are set up as a separate company. This company takes all of the film's costs, while giving up 35% of everything the movie makes as fee to the parent studio. So while the studio starts to make a fee off every cent the movie brings in, the movie itself continues to run at a loss unless it is super hit like, say, Avatar. As Planet Money found out, the movie Gone in 60 seconds, that everyone in the world has seen - is losing $212 million. After the break is the leaked income statement for the Harry Potter movie that originally prompted this post. The music industry follows a similar model. Here instead of the separate movie company, the impacted party is the artist themselves. All costs borne by the artist while 63% of everything the album makes goes to the Record Label before it is offset against the costs. Apparently Courtney Love did a great job breaking down the accounting almost 10 years ago. There you go - no wonder the MPAA and RIAA can find numerous examples of loss-making movies and albums. It is because they are designed to lose money in the first place. A new symbol for the Indian Rupee has been announced. Back in March of this year, the Indian Finance Ministry announced a contest to crowd source designs for the Indian Rupee. Unlike other currencies like the Euro, Dollar, Pound etc, the Indian Rupee was always referred to as INR and did not have a symbol. The contest ended on April 15, and we now have a winner. Designed by a student of IIT Bombay (starting as a faculty in IIT Guwahati), the new symbol is a play on the Devanagri letter for 'Ra' and the Roman letter 'R', while reflecting the Roman letter 'e' as well. (Re was also used in place of INR to refer to the Indian Rupee). The best part about the symbol, is that it looks so natural. Almost like something I would have designed. But did not. And I think the way it beautifully straddles the familiarity of concept with the clarity of design, is what makes it work. Slate magazine has an awesome science section. Found this article in the section. Now I finally understand why I love Stumbleupon so much, even though I do not always spend time with the results of the stumble. Research, as quoted in the article, has identified two distinct types of stimulation centers in the body - one that deals with seeking/wanting and another that deals with liking. Seeking or wanting is the dopamine-based ultimate mammalian motivational engine. It is what makes us want to get up, seek, be curious, forage, crave, expect etc. Scientists have found that this is distinct and different from the opoid system of experiencing pleasure and satisfaction. In other words, the seeking system stimulates us to hunt, and the pleasure center makes us happy after success. In human beings, the stimulation of the seek is stronger than the pleasure of success. Which makes evolutionary sense. Any animal with the pleasure center stronger than the seeking center quickly dies out, though completely satisfied. Humans, along with many of our contemporary mammals love the stimulation of seeking more than the satiation of success. And that, ladies and gentlemen, is why I love to stumble so much. And you like to use Facebook, or twitter, or Google. Our evolutionary seek centers are driving us to distraction with the easily availability of the 'seek'. Came across this really informative post via Slashdot, on a Google researcher's presentation on Social networks. 216 slides and worth it. Paul Adams, the author of the piece, has a few compelling ideas that he introduces as part of the pitch - focusing on how Social Networks have got social networking wrong. Paul starts off by showing how, by their very nature, social networks lump different types of acquaintances together under the umbrella of “friends” creating an inherently awkward atmosphere. By referring to everyone as friends, social networks (*wink* facebook *wink*) ignore the reality that people have distinctly different groups of friends. Secondly, social networks also do a poor job of differentiating between strong and weak ties. Not everyone in a given group of friends is equally close to us. Instead social networks take the Twitter approach of treating everyone the same - giving rise to overload of trivial updates. Thirdly, users care about privacy. But privacy is not a two-state concept or private or not private. Instead it is a much more nuanced state of private, public and publicized across different groups and strength of ties. The entire presentation along with the speaker notes after the break. Came across a good short story while stumbling today that I really liked. Small, simple and well written. The Egg by Andy Weir.